Henry Mah reported aboard on Friday evening, May 4, and Carroll Christiansen and Craig Alger arrived the next morning after a night in a local hotel. We spent Saturday in boat familiarization, planning the meals and buying the provisions. The rest of Saturday and Sunday were devoted to completing the voyage preparation checklists, verifying stowage and emergency plans, rigging the storm trisail, and stowing the boat for sea. Plans to top off fuel before departure were canceled because there was no room at the fuel dock because so much of the marina space was being taken up by the charter boat show. Since we knew the tank had been filled earlier in the week and the engine had been run less than an hour, I felt comfortable with the fuel load. Sunday, 5/6. In late afternoon we leave Crown Bay for an anchorage. With the south wind causing a swell to make all the usual spots look uncomfortable, we had to search for an hour or more before finding a safe and comfortable spot in Careening Cove on the east side of Hassel Island. We stand anchor watches over night because adjacent boats were on moorings and have significantly smaller swing circles. Pork chops for dinner. Monday, 5/7. After medical briefing by mate Lee Tucker we complete final preparations and departed. Stiff southerly winds and lumpy seas prevailed in the waters south of St. Thomas. We set sail off Savannah Island, after which the winds and seas moderated markedly, but we are able to sail most of the day. Spaghetti for dinner. Tuesday, 5/8. After sailing through the night, the day dawns clear and sunny with wind and sea continuing to ease. Contrary to the usual easterly winds in this area, we experience south and southwest winds, seldom more than 12 knots and often less. The principal activities of the day are sun sights and trouble-shooting a chronic autopilot problem. The day ends with heavily clouded skies and fading wind that force us to resort to the diesel engine. "Chicken Chico" by crew member Craig Alger for dinner. Wednesday, 5/9. The day presents a mixed bag of good sailing on a 13-14 knot northeasterly, alternating with frustrating periods of motorsailing when the wind falls too light to maintain boat speed. A large northerly swell generated by a storm off Bermuda adds variety to the boat's motion. Frequent heavy cloud patches and scattered showers preclude much activity for the celestial navigators. Managing fatigue as the crew gets accustomed to the routine (4-on, 4-off, 4-on, 8-off) gets most of our attention. Hot dog reubens in tortillas for dinner. Thursday, 5/10. The wind backs to the north and stays light, so we motorsail. The autopilot is now off more than it is on, so extended periods of hand steering are needed. The boat proves to be difficult to keep on course, with heavy loads on the steering system. A chattering vibration in the rudder gets our scrutiny, but the source cannot be located. A sunny and fair day, we set up the weatherfax program on a laptop and start looking for useful weather chart info. Pasta with vegetable and tomato sauce for dinner. Friday, 5/11. At 0300 we pass through a line of rain showers (with very little wind) and then the wind fills in from the northeast and builds to 15 knots. We have a delightful day of close reaching in moderate seas. Chicken stir fry for dinner. Saturday, 5/12. A beautiful day of broad reaching on light north to northeast winds, interrupted only by a surprise flooding/abandon ship drill. Set the cruising chute in the afternoon and keep it up until sunset, after which the wind fades as we move into an area dominated by a large high pressure system. Dinner is red beans and rice with kielbasa. Sunday, 5/13. Mother's Day is clear, sunny and calm, and after motoring through the night we find it necessary to continue motoring all day. The wind finally returns and we resume sailing at midnight. Monday, 5/14. The wind builds gradually during the day, then a frontal passage brings a shift to the northeast and we sail the remainder of the day on moderating winds. By midnight we are forced to resort to motoring again. Dinner is chili. Tuesday, 5/15. After motoring through a clear, starlit night, the wind fills in at 0800 and continues to build through the forenoon watch. By afternoon the sky is clouded over and squalls develop with winds highly variable in both direction and strength. A 37+ knot gust removes the Windex vane from the masthead. As we approach the Carolina coast, the forecasts for the time we expect to cross the Gulf Stream are discouraging: several days of northeasterly winds in the 25+ knot range, conditions that would make the stream very rough. We decide to opt for an inside passage using the ICW instead of rounding Cape Hatteras and shape a course for Beaufort, NC. After 5 hours of sailing to the northwest at 5-6 knots, we find we have only made 10 miles good, the result of a strong (and unexpected) southeasterly current. We choose to bear off and reach northward on the steady 25-29 knot westerly wind, hoping to find a small weather window in which to get across the stream. Dinner is highly doctored (hence palatable) Dinty Moore beef stew. Wednesday, 5/16. A midnight encounter with a series of severe squalls featuring gusts to 40 knots, shifting winds and heavy rains starts the day. Once clear of the system, the wind goes light and we motor northward on calming seas. A midday stop for a swim call allows us to inspect the rudder and detect some looseness in the rudder itself, the only identifiable source for the recurrent chattering vibration. The autopilot seldom works for more than a few minutes, so hand steering is continuous duty. A light northeasterly arrives in the evening and we can resume sailing closehauled on starboard tack. Dinner is pork, mashed potatoes and stir-fried carrots. Thursday, 5/17. 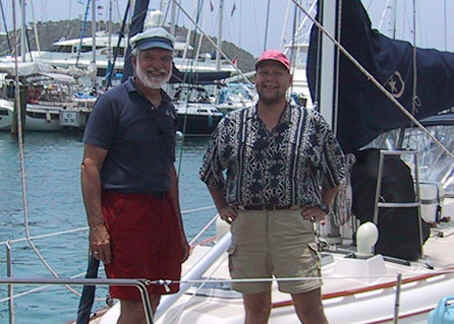 Continuing to sail close hauled in a light northeasterly that has not caused the Gulf Stream to kick up as much as one might expect, we beat our way around Cape Hatteras in choppy but not severe seas. By midday we exit the stream just north of Hatteras and the water temperature plummets from 77.7 to 62 degrees in 15 minutes. We sail northward along the NC coast until sunset, when the light breeze fails and we resort to Mr. Yanmar again. With sea temperature down to 59 degrees, it's a chilly night. Dinner is black bean soup with kielbasa. Friday, 5/18. In continuing light air, showers, overcast and occasional fog, we motor the final miles to the Virginia Capes and enter Chesapeake Bay, mooring at Taylor's Landing Marina in Little Creek just before noon. With 1452 miles on the log, we've seen a broad spectrum of wind and sea conditions, coped with manual steering for days on end, turned a couple of novices into polished celestial navigators, and sharpened everyone's offshore sailing skills. Plus we had a good time, with lots of laughter and close camaraderie. After cleaning and restowing the boat, everyone heads for home and everyone seems to be satisfied with their experience on the passage.